We no longer carry the 1979-95 Mustang 28oz Fluid Dampner Harmonic Balancer Kit Chrome. Check out Mustang Harmonic Balancers for an updated selection. Replace your factory crankshaft damper/harmonic balancer in your 79-95 Mustang with this direct replacement. This is a stock replacement style harmonic balancer. It fits 1979 Mustang 5.0L & all 5.8L converted Mustangs using stock serpentine drive. 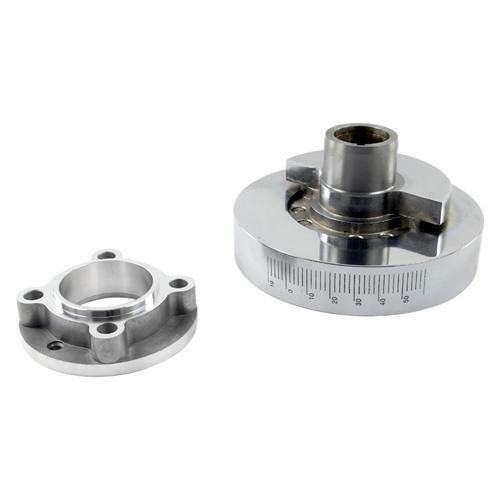 This balancer has visible timing marks and includes the pulley spacer. The factory Mustang Crankshaft Damper can only handle so much abuse before it loses the rubber insulator and can damage the timing cover. By visual inspection you can determine if this is a potential problem as the outer ring will appear to be wobbling as the engine is running. Save your timing cover & engine by replacing your Mustang Harmonic Balancer today!